Latest reports are that buyers are more optimistic about the housing market than they have been in some time. Actually I would say from an “on the street” perspective, that buyers are more concerned about jumping onto the housing train more than ever as prices continue to rise. 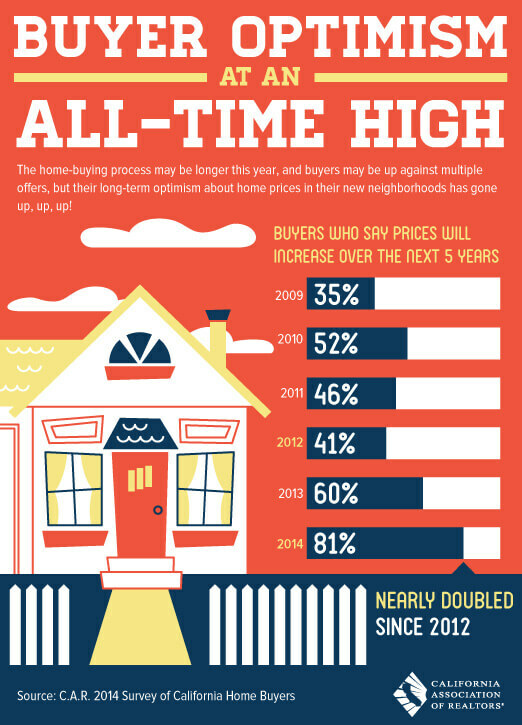 What this study is stating is that buyers are feeling confident that prices will rise over the near future and that’s why they want to buy now. In speaking to several buyers this past weekend at my open houses, I felt that the buyers were asking more of the important questions regarding home ownership – questions regarding payments, homeowner association dues, fees and pricing – more so than buyers did just a few years ago. There wasn’t a crazy euphoria in the air as this chart might suggest. Could it be that they are more informed now or just more budget conscious or both? FACT: While it’s true you can find a lot of information about housing, sales, listings and property details online these days I feel it just confuses most consumers. Consumers have to guess at values more so than in the past with such things as Zillow’s “Zestimates” and trying to figure out why one home of the same size sold for more than another – without taking into account the upgrades and condition of each home because they can’t personally see each property to know the difference. To be honest, I believe that there is too much information available – that is there is just enough to give consumers ‘almost’ all of what they need to know to purchase a home but without the clearest details to make an informed decision. It reminds me of a great restaurant in Westlake Village that unfortunately is no longer there – Jack’s Deli. That place had so many pages of items on the menu that I couldn’t figure out what to order – so each time I came back to the same plate, the Reuben sandwich, because I couldn’t figure out what else was good. Too much choice can be a bad thing. My feeling is that yes, buyers are optimistic that prices will continue to rise (which I agree) but there seems to be more caution towards the buying process than ever before. I’ll have the 3 br/2 ba condo with a view, thank you….and hold the HOA fee please.